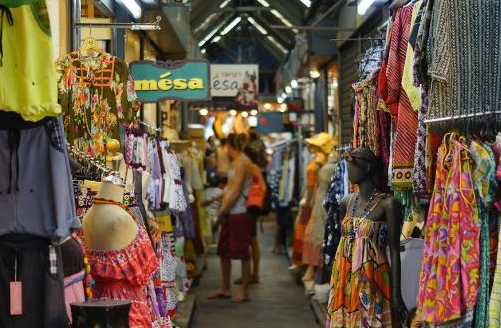 Thailand has many options for shopping, but one of the most popular locations listed on many Thailand tours is the Chatuchak Weekend Market (also known as JJ Market). The Chatuchak Weekend Market is the largest market in Thailand and is estimated that it covers over 35 acres. The market was opened in 1982 and currently features over 15,000 stalls, but most of the stalls are only open on the weekends. Many estimates put the visitor count at over 200,000 per day on both Saturday and Sunday. The Chatuchak Weekend Market sells just about anything and everything from clothing & accessories to handicrafts and ceramics. There is furniture and home decoration items along with art, antiques, and collectibles. There are also a handful of food and beverage stalls so you don’t have to worry about getting hungry while shopping. Most people will spend many hours at the market so be sure that you dress comfortably. It is also mainly an outdoor market although there is a portion that is indoors, so be prepared to spend long hours in the heat and sun. Directly to the north of the Chatuchak Weekend Market is a newly constructed, air-conditioned mall called JJ Mall. The JJ Mall was constructed in 2007 and is the first fully air conditioned mall at the Chatuchak market. The mall is 7 stories tall, but half of those floors are reserved for parking. The other half sells items similar to those that you would find at the outside market such as handicrafts, arts and antiques along with home furniture. The JJ Mall is similar to any other mall, but they tried to keep the small market atmosphere by having small stalls selling a wide range of goods. Other than the air conditioning, the other difference that JJ Mall has over the Chatuchak Weekend Market is that it is open daily, so if you are unable to make it to the market on the weekend, you can still drop by JJ Mall on a weekday. Chatuchak Weekend Market is located on Kamphaeng Phet 2 Road in the Chatuchak District of Bangkok, Thailand. The market is easily accessible by either the BTS Skytrain or by the MRT. To access the Chatuchak Weekend Market using the BTS Skytrain, take the BTS Skytrain Sukhumvit Line to the Mo Chit Station. To get to the market using the MRT, take the MRT Blue Line to the Chatuchak Park Station. Both options will put you to the east of the market. If you don’t feel comfortable venturing out on your own, you can always sign up for the Chatuchak Market(JJ Market) Tour. Here is a link for the Chatuchak Market(JJ Market) Tour. 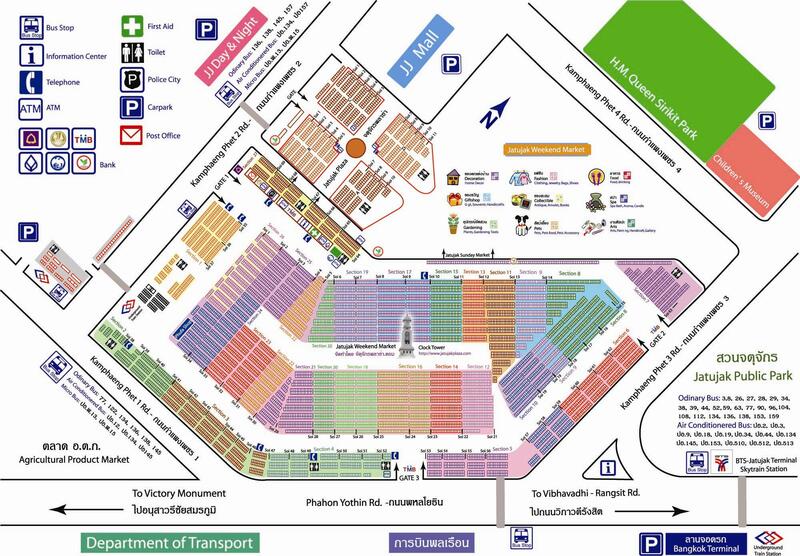 Here is a map of the Chatuchak Weekend Market.